This awesome Jupiter-2 model was hand built by talented Orne Montgomery. 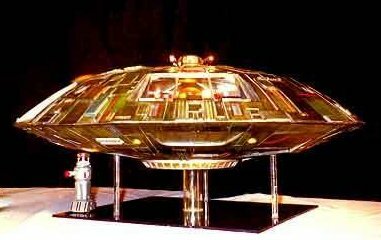 The item was on display at the LIS "Return to Earth Celebration" in Hollywood on April 3-5 1998. Mr. Montgomery spent 1 year detailing a full blown Jupiter-2. The hull had individual plates. With the interior complete to the smallest detail. The Jupiter-2 was a Lunar model 24" and increased the kit to a 26". The Jupiter-2 has retractable landing gear, airlock hatch opens and closes. There are 65 lights inside (rice & grain wheat bulbs with several 7.2 mags for the main interior. With fushion core drive illumination A340 watt transformer runs all the lights. The wire soldering was done by Adam Stines. Electrical systems, operating lights was done by Aaron Mack. Dave Campitt publisher of Innovation Comics included this artwork design in there comics starting from issue #9-18. This was official with Mike Evans and ViaCom when they saw this masterpiece. (Making this the "Comic Book version Jupiter-2". "This is truly the best Jupiter-2 model I have ever seen built by scratch by a fan!" I would like to thank Orne Montgomery and Steve Iverson (CultTVman) for the info on this Jupiter-2!